Ulan-Ude is a blend of Buddhist, Orthodox and Soviet heritage, and a place where the customs of ancient nomads survive to this day. Like many Siberian cities, Ulan-Ude grew up around a small fortress built by Russian Cossacks in the mid-17 th century. The annexation of the Buryat people’s land by the Russian Empire has in time, formed a cultural cocktail unlike any other in Russia. Everyone who conquered this land added something of their own to melting pot of Ulan-Ude. Or more precisely, the togoon – that’s the name of the huge vat which can be found suspended over the hearth in the centre of a yurt , the traditional tent of the local nomads. The rows of merchant houses decorated with carved wood and stone in Ulan-Ude's historic centre recreate an atmosphere of a comfortable and prosperous provincial town in 19 th -century tsarist Russia. The city’s main street, originally named in honour of Tsar Nicholas I but later renamed Lenin Street crosses the whole central part of the city and links the two main squares, which also hark back to the Soviet past: Revolution Square and Soviet Square. The street ends at the local bastion of Orthodox religion – the Odigitrievsky Cathedral . Built in an area of high seismic activity, the church has successfully survived not only two changes of government but also two earthquakes. Two blocks away from the church is Bazaar Square. For more than 100 years, Russian merchants organised markets here and traded busily. Today the square is once again home to numerous cafés and shops, where you can find a good selection of authentic Buryat souvenirs and pause for a light lunch. Ulger Café ( at 46 Lenin Street ), a nearby favourite, offers a mix of traditional Buryat-Mongolian dishes and European food. We recommend trying out Buryat sharbin or khushuur meat-filled dumplings ($2) and a cup of local nogoon sai tea. Art lovers can visit the nearby Art Salon ( 26 Kuibyshev Street ) run by the Buryat Union of Artists. The salon's exhibition offers for sale works of art, including traditional paintings, graphic art, jewellery and works from the ancient art of horsehair tapestry. Soviet square features the world’s biggest head of the Vladimir Lenin, standing 13.5 metres high and weighing 12 tonnes. The monument has been honoured with an entry in Guinness World Records . Ulan-Ude has more than 10 different museums, the most famous of which is the open-air Ethnographic Museum of Transbaikal . The 37-hectare site is divided into several museum complexes, each of which shows the way of life of various eras and ethnic groups which have populated this part of East Siberia. The museum has more than 40 architectural monuments, and also more than 11,000 exhibits, which represents a quite large-scale attempt to reconstruct the reality of the past, from the most ancient Hun civilisation in the third century to the start of the 20 th century. Next door to the Ethnographic Museum is one of the most popular Buryat establishments – the Baatarai Urgoo café yurt (the name means 'Brave Warrior' in Buryat). The café’s owners have completely preserved the characteristics and traditional layout of the dwellings of the nomadic steppe tribes. They have also preserved their traditional cuisine. They have a very impressive list of Buryat dishes and drinks, and the prices are very reasonable. For Buryat people, a meal is not a meal unless it is big, like a feast. Meat delicacies are made from mutton, beef, fish from the Selenga River and even bear meat. The best-known meat dishes are buuza or poza – large dumplings made the Buryat way. The nomads were also ahead of many in the originality and variety of their dairy cuisine, from the widely known segee , a healthy drink made from mare’s milk, to urmen , which is the foam from boiled milk. Even the traditional Buryat alcohol – tarasun – is made from sour milk products and known as milk wine. The Baatarai Urgoo café yurt often puts on folk music concerts where you can listen to a form of singing which is quite rare in the modern world – throat singing. For those wishing to spend the night, the site includes two-bed and four-bed yurts for tourists who want to feel like nomads. There’s also a mini-hotel, where the ethnic flavour is organically combined with satellite television and Wi-Fi (a room costs around $100). The Ivolginsky datsan (monastery), is the biggest Buddhist temple complex and capital of traditional Sangha monasticism in Russia. Remarkably, the temple was built in 1945, a period during which religious adversity flourished. The temple is only a 30-40 minute drive from Ulan-Ude. A second Buddhist monastery lies within the city limits of Ulan-Ude. 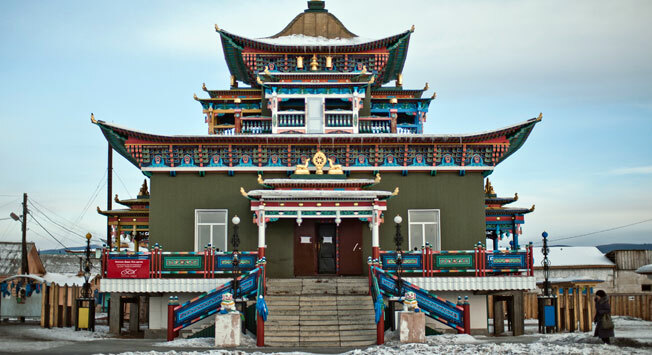 The Zungon Darzhaling Buddhist women’s datsan is now the only women’s Buddhist monastery in Russia. The monastery includes a stupa containing sacred relics – traces of blood and a piece of bone from the Buddha. You can end your day in the company of the Buddha in the most picturesque place in Ulan-Ude - Mount Lysaya. Here you can get a view of whole city and the surrounding area lying in the valley of the rivers Selenga and Uda. On the ground where Buryat tribes once held their pagan Sabbaths, there now stands the Rimpoche Bagsha Buddhist centre. Ulan-Ude's most popular souvenirs feature Buddhist symbolism and are made from precious stones. The city's shops also sell Buryat-style jewellery, traditional folk dress and repoussé silverware. The best time to visit Ulan-Ude is at the end of February or the beginning of March. This is when the Buryat people celebrate the most important festival of the Mongolian-speaking people – Sagaalgan. Sagaalgan is the beginning of spring and the New Year according to the Mongolian lunisolar calendar. In the first weekend of July, Buryats celebrate Surkharbaan. The festival has three stages of competition: archery, Buryat wrestling and horse racing. Winning at Surkharbaan is very prestigious. The prizes are usually sheep, though cars have recently been added as well. In July, Ulan-Ude also hosts Voice of Nomads. The world music festival not only features performers from Buryatia, China, Japan and Mongolia, but also from Belgium, Norway and the USA.